First let me start this blog by saying that if you’re Christian, and going through the start of Lent with yoru lack of meat on certain days, this is not a sandwich that will appeal to you. This may not be for you even if you’re not celebrating Lent, because this is a blog about a burger. 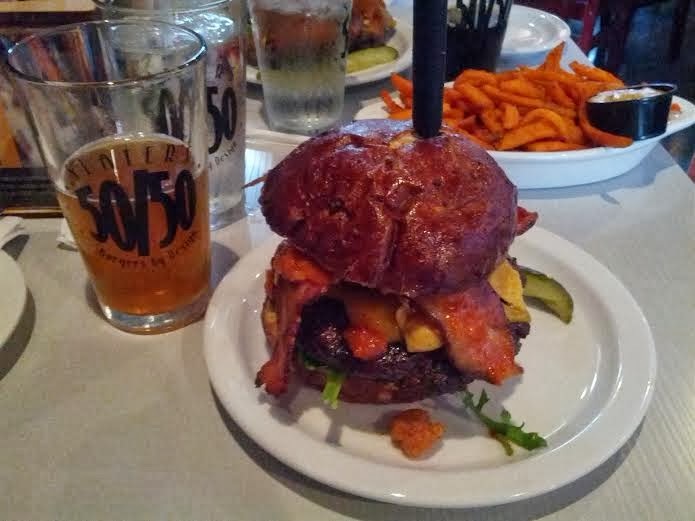 A burger with a truckload of bacon. On a suggestion from a coworker to visit the burger shack known as Slater’s 50/50 in Pasadena, I headed out with my usual burger companion Bryan (@818newguy) to see what this place promised in regards to its loudly professed love of bacon. Slater’s offers two options: 1.) the standard set menu, with their deliciously crafted sandwiches listed to make your life easier; and 2.) a Choose Your Own Adventure burger menu, allowing you to craft your dream sandwich, and even name it. Taking my time with the menu, I crafted a burger that I named Hog Heaven, or “So Long Arteries”. Look, if there’s bacon in everything here, I’m going HAM…or…bacon. You know how it is. 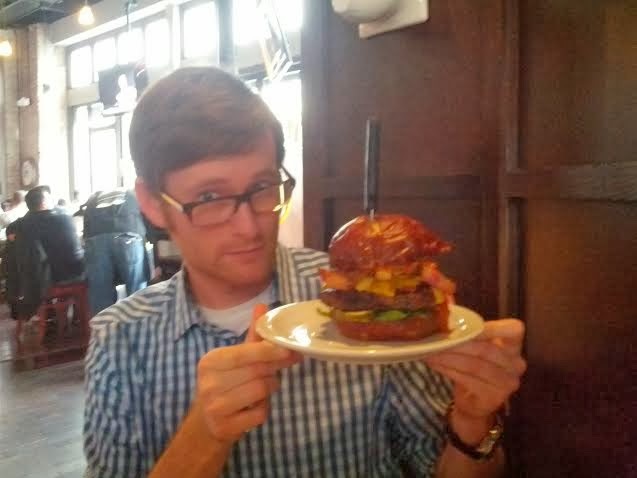 I started with a 2/3lb 50/50 burger. That’s 2/3lb. after cooking. The 50/50 patty, the one their known for and named after, if a patty consisting of 50% ground beer, and 50% ground bacon. mine was cooked to medium doneness, allowing for a warm pink interior. For the bun, in this pub-style setting i thought that a pretzel bun would work great. Not only would it add more flavor over a regular white bun, but I also needed something that could tough it out and handle the burger itself. The twist on this burger though? The pretzel bun had bacon in it too. The list of additional toppings contains a dizzying variation of items that you can choose from. Wanting to differentiate Hog Heaven from other burgers I’ve had, I added dill pickle chips (a standard) but then went in a different direction by adding Fritos for a bit of crunch. Oh, yeah, and some arugula too. You know, for the peppery bite…and for the illusion of something healthy on this sandwich to counteract all that bacon. Just because I have an unnatural love of bacon, I added an item from the “Premium” list: Thick Cut Bacon. For the final selection on the menu, I decided to go with Slater’s Bacon Ketchup. I mean, if I was going all-in with bacon, why not, right? The ketchup had some texture to it, somewhat thicker or chunky looking from the bacon included in it. It was delicious as it was like regular ketchup with a bit of bacon-y smoke goodness. So that was my creation, Hog Heaven. Wild right? But was it any good? Have my years of sandwiching paid off and given me the talents to create a decent sandwich? The bacon, though thoroughly infuse din this sandwich, is delicious and very present, but not overpowering. 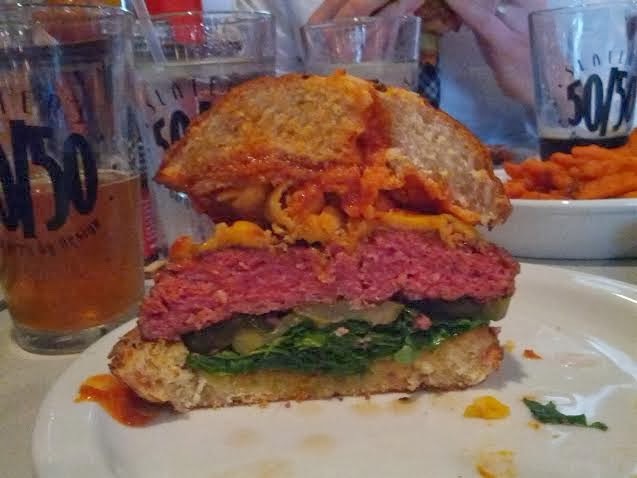 I was still able to taste all of the individual ingredients, even the arugula and pickle chips. The Fritos and thick cut bacon both provided the contrasting crunch to the sandwich with their salty kicks as well. The patty is the real standout here, and it is definitely obvious as to why this is the namesake of the restaurant. The 50/50 patty cooked to medium doneness provides a delicious contrasting of flavors between the smooth and mellow beef flavor, and the smoky/salty cut of the ground bacon. This is a great combination and really brings the burger to life, more so than other all-beef burgers. Since I can’t exactly review my own creation (although I think it’s delicious) I can say that if Hog Heaven is any indication of the deliciousness of all of the components, and an insight into the greatness of Slater’s 50/50’s in-house burgers, it’s a fantastic place, and well worth your visit. I should not have read this on a Friday, during Lent, 3 hours before I get to eat lunch. Add this to the list of places to go next time we come out and visit.